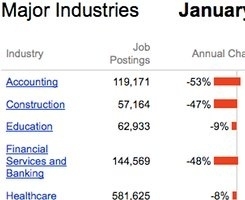 File Under "Ominous Job Trends"
Indeed.com has published its findings on the drop in job listings in different industries over the past year. In other words, what is the percentage change in job postings from January '08 to January '09? Well, as you can see from this chart, opportunities are drying up all over the board. In particular, note the decreases of almost 50% in finance, retail, and media/publishing. However, as we've mentioned before, not all industries struggle during a recession. For example, healthcare and education are still going strong. And though the job postings have dwindled, we still believe that there are a lot of accounting opportunities out there as struggling companies try to get their books water-tight. 1) If you are having trouble finding opportunities in your industry of choice, don't get too discouraged. The average pre-recession job hunt took four months, so it makes total sense that it would take a little longer given these numbers. 2) Again, not all fields are cutting back drastically on hiring, so if you have a range of professional interests, it may be worth being a little bit flexible and adapting yourself to the current needs of the job market.